a few weeks ago (a couple of weeks before the school holidays) Owen started going to Joey’s (Joey Scouts is for 6-7.5yr olds before they join Cub Scouts). He is having such a ball and was constantly asking me for a Joey Scout uniform. He was allowed to wear the shirt before being invested so I bought one last week and gave it to him only to have him ask about the scarf and badges lol! Anyway we got a call last night from ‘Echidna’ the Joey Scout leader who opened with ‘can you bring your camera to Joey Scouts on Monday (hmm she doesn’t know me too well yet of COURSE I can bring my camera)! She went on to say they were going to invest him on Monday night. Well I handed the phone over so she could tell Owen – wish I had the camera with me right then to get the BIG smile on his face as she told him! I got the phone back and she started to say ‘about where you stand taking photos’ and I was thinking oh the restrictions etc etc….then she went on…’he only gets invested once you stand WHEREVER you need to, to get a good shot’ I LOVE this woman! she gets it! I was even a good ‘single’ Mummy and rang his dad today to let him know and it appears that he will come too. I do want daddy to support the Joey Scout thing as Owen really is loving it and I think it really can only do good things for him (his pead agreed). His sleepover at scienceworks is not this weekend but next weekend too – man he is sooo excited! yes girls there is still time to book your place at the table for the mini album class. I will pop more photos of the little album up later today/this evening. oh so many years ago in another life before kids I used to work in workcover insurance…. one day my immediate supervisor transferred a call through to me from our new member of staff in our Bendigo office telling her to ring me if she needed any questions answered (ie don’t bother her lol)…who would have guessed that we would become such good friends at that time. Some silly french lady who didn’t understand that the term ‘silly cow’ was a friendly jest! Since that day this girl became a part of my life. She didn’t just help me move house she was a whirlwind of packing frenzy. She stripped wall paper, she ripped up carpets and polished boards. She put up with my 8 month pregnant exhaustion. She helped me through the times when little baby Owen didn’t want to sleep…she took me to hospital when I had a gallbladder attack. I knew that she was moving back home to France. I know she needs to go that she is doing what is best for her and for the kids. And yes I was going to miss her but hey we haven’t seen ‘that’ much of her lately anyway….but you know what…we didn’t need to see each other to stay friends. A little dinner and a chat was enough to remind me and you know what I am gunna miss that girl! She is off soon to the airport….going home and it is bitter-sweet for her as she goes home to so much but leaves stuff behind too. Take girl and stay in touch cause I am gunna miss having you here. What better way to launch a new mini Catalogue than with a mini album Class? When? Saturday evening the 2nd August from 7-10pm. What do I get for my money? All the materials necessary to make your own mini album plus a FREE stamp and a light super, tea and coffee (byo other drinks). Be among the first to see the new mini catalogue and try out some of the new papers and stamps and maybe meet some new friends in the process! and I have started to get to work so here is a little bit of a preview for you…..
house sitter organised, kids organised, bag packed…now if I could just find my CAMERA I’d be all ready to go! yep you heard right I’m the scrapper who has misplaced her camera! oh well it can’t be far away I know I had it out to make a pattern for my leather pouch to make sure the pouch was the right size for camera and phone. have a great weekend everyone I know I will (and Stephen has his camera so we won’t be cameraless even if mine doesn’t turn up – am meant to be in bed by now – have to get up at stupid o’clock for a 6am flight! 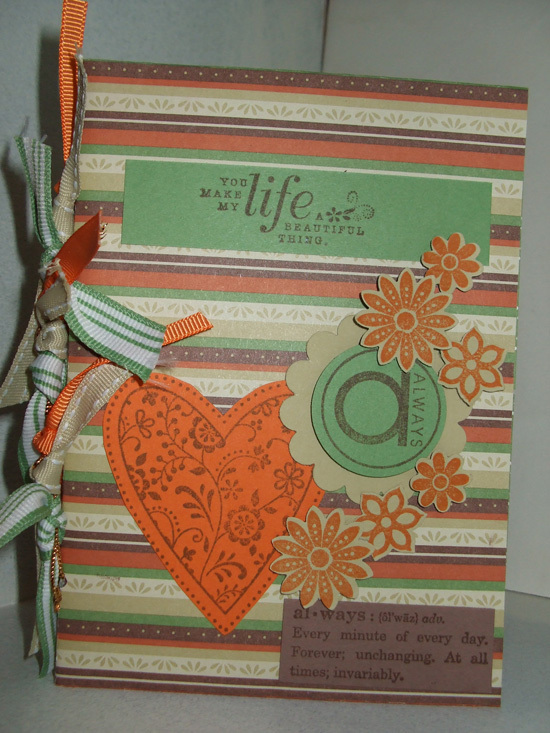 SU Apple Cider paper and more…. Oh I got a lovely box delivered to my door today! I should be working. I should be preparing for my trip on the weekend and yet my mind keeps going back to the beautiful box of stuff I want to play with! Don’t forget if you want to be amongst the first to use items from the new mini cat then book in for a launch party/mini album class and get all the materials to make your own beautiful album….sample coming soon!